Hi, everyone! I’ve been lurking around for a while like a creeper and figured it was time to join the party. And thus, my love for titanium rings was born. Thats crazy ive never seen such a thing. Can we see it on your hand 🙂 I bet it makes your diamond POP! That looks really cool! I’ve never seen anything like that, I like it! Ure ring is amazing, love the darker color! Any takers? I know that titanium is generally used in men’s bands (found that out after a solid year of searching with Fiance for my dream ring), and I’d love to see those too. Very cool and very unique…are you doing the same with the w-band? I think it is great to be diff! Oooh I love it! I love black metal rings, I wish I saw them more 🙂 very cool. I don’t have my wedding band yet, but I’m getting a Titanium band!! Here’s the stock photo on a model’s hand, I’ll post ‘real’ pics when I get it next week!! 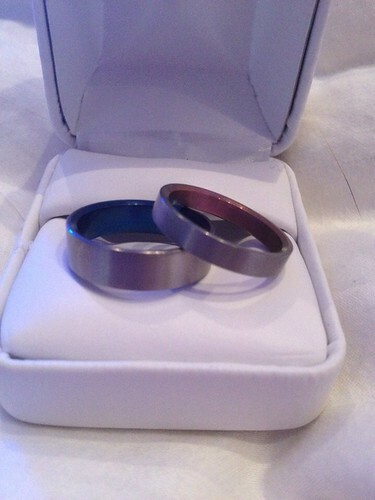 OH we have titanium wedding bands! Yes, they’re pink and blue inside! And your engagement ring is gorgeous!! Congrats! I adore the black finish, it’s so chic. @MabelleBliss: I love it because they’re our little secret until we show someone.